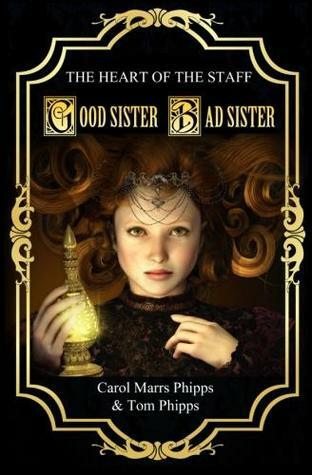 GOOD SISTER BAD SISTER by Tom and Carol Marrs Phipps is the first book in an epic series titled THE HEART OF THE STAFF. Like Alice and Malice in Wonderland but instead of falling down a rabbit hole, it uses a magical "scrying ball" to help you travel through the enchanted kingdom. Niarg is inhabited by witches and wizards, humans, elves, and fairies, unicorns and dragons, and Ocker, (my husband's favorite) a magically endowed raven, clever, ambitious, and a trifle avaricious. works to help the sick while Ugleeuh runs off to learn magic from her Uncle Razzorbauch. Ugleeuh's mother is the powerful sorceress, Demonica, who shows up at times to stir things up and add to the overall intrigue of the story. The action keeps the story flowing to the end. Here's a quote from Chapter 11: "Demonica set to work at once, hurling crackling lavender bolts from her staff into the faces of beast after beast as they thundered from the caves..."
The descriptive prose provides good imagery. Here's a quote from Chapter 7: "...his castle was near the top of a great prominence overlooking a vast sea of twisted trees." All in all, I enjoyed reading the story aloud with my husband. I'm happy to recommend it to lovers of fantasy and magic. We have purchased THE COLLECTOR WITCH to continue with the epic. Sign into Goodreads to see if any of your friends have read Good Sister, Bad Sister.